“The Naming of Gedney/Hat Island” talk June 24 at 7 p.m.
Home » Blog » “The Naming of Gedney/Hat Island” talk June 24 at 7 p.m.
A link to the slave ship Amistad, the murder of French Peter – a Hudson’s Bay fur trapper, a feud over firewood, rum-runners, a practice bombing run during WWII… who would have thought little Gedney/Hat Island just east of Langley held such intrigue? And who would ever guess that the Naval officer (Lt. Thomas Gedney) that the Island was originally named for would engage in an endeavor that ultimately (and unintentionally) strengthened the abolition movement and helped lead to the Civil War. Come to this Saturday’s “Then and Now” presentation on June 24 from 7 – 9 p.m. in the Fellowship Hall of the Langley United Methodist Church. 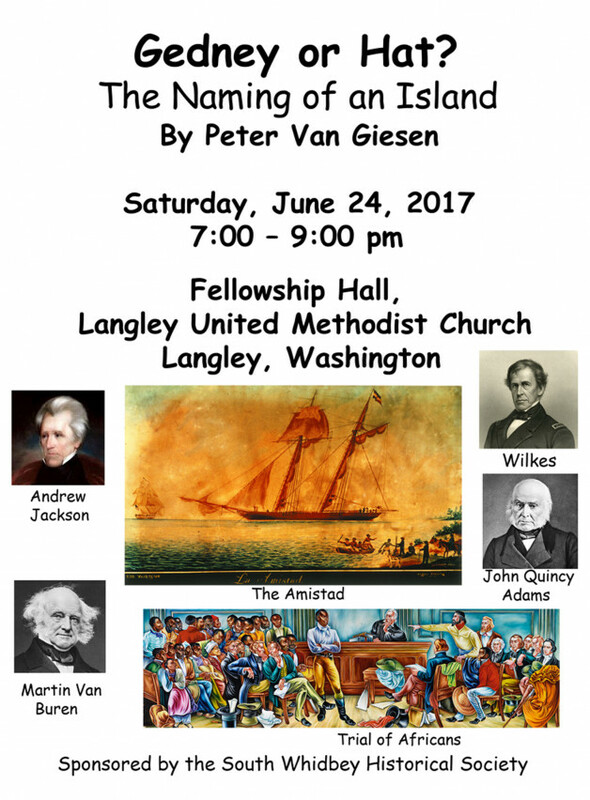 It’s sponsored by the South Whidbey Historical Society and features guest presenter Peter Van Giesen. The talk is free, but donations are appreciated and help us present events such as these as well as providing for the upkeep of our museum, fair buildings, our website and Facebook page. Thank you.